Recently We recorded 2 Muk Yan Jong practice sets for you on YouTube. When working with the jong, focus on technique and structure and not so much on hitting the wood hard. While there is something to be said for conditioning the body. When your training your skill it’s more important that you focus on skill. Over time with practice your striking will become more powerful. If you try and “hit” hard you will most likely injure yourself. Early on in my training I made the mistake of hitting the jong to hard. I ended up hurting my arms and getting really bruised up. The first one teaches a beginner or basic drill. This particular video focuses on dealing with inside the arm. There are inside and outside arm techniques. In this video the focus is on working the inside of the arm. We also wanted to give our YouTube followers a more advanced training drill. This video involves footwork and hooking around the arms. After filming these 2 Muk Yan Jong videos we quickly realized that people are hungry for this knowledge. This is why we will be adding a ton of jong training videos inside our Enter Shaolin Membership. I am often asked by folks how can they train without a training partner. 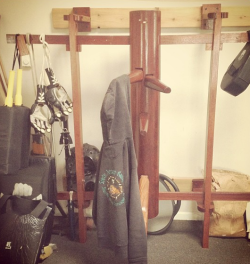 A Wooden Dummy (Muk Yan Jong / Mook Jong) is one of the best training tools you can have in your arsenal. Tip: When buying a jong do your research. My jong was one of those factory made jongs. I spent $800 for it. Compared to my sifu’s jong it’s not very impressive. I recommend looking for a custom made jong. They are built better and they just feel better. I am currently looking into a place, I don’t want to recommend them until I buy my new jong. However after I get it I’ll do a review for you. Thanks Kevin, glad you enjoyed the article.